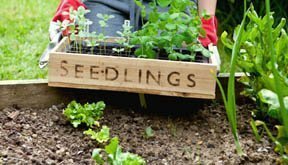 Whether you start your vegetable and ornamental annuals from seed indoors or buy them at local garden centers, I’m sure the moderating temperatures of the new spring are making you anxious to get growing in the garden. Planting time is, indeed, upon us, but before those warm-season plants are set in the ground, here are some timely tips to help get your transplants off to a strong start. * What is the temperature of your garden’s soil now? The air temperature might be rapidly on the rise, but soil temperature, which is more important to the initial growth of tender young transplants, always lags behind. Stick your hand about 8 to 10 inches into the ground. Cool, isn’t it? Well, it might be mildly pleasing to you, but it gives many warm-season plants the s-s-shivers. Generally, the soil needs to heat up to at least 60° to 65°F before it is conducive to stimulating growth in heat-loving plants. * An easy way to help raise the soil’s temperature before planting time is to spread a sheet of black plastic over the rows or beds and let the natural heating of the sun do the rest. Liberally slice short slits in the plastic to allow spring rains (which also help warm the soil) to filter into the growing ground below. When transplanting, simply cut an “x” where you want to place a new plant and set it in the soil through the plastic. As the heat of the coming summer begins to turn hot (usually by the end of May in the Triangle), instead of pulling the plastic up, use it as an effective barrier against weeds by leaving it in place and simply covering it with a few inches of organic mulch such as bark, compost or ground-up leaves. * As the planting site needs to warm up before transplants are set in, so it also needs to be conditioned. If you break up the soil with a rototiller or shovel a few weeks before planting, you will make it much easier for young plant roots to grow and expand. One word of caution: If you have clay soil, do not till your garden while it is wet. If you do, the largest crop you will harvest from such soil will probably be dirt clods. To see if your soil is dry enough to dig up, grab a handful and squeeze. If you wind up with a lump of hard goo, it is too wet to work, so let it dry out a few more days. * While loosening up the dirt in your planting site, toss in a little fertilizer (a time-release type is ideal) and a lot of organic matter in the form of compost or commercial soil conditioner into the planting bed. The fertilizer will help get transplants off to a fast start, while the organic matter will add additional nutrients to the site and improve the tilth of the soil. * When transplanting, pay close attention to correct spacing. Cramming young plants into tight quarters can not only cut down on proper fruit or flower production but such close spacing also invites diseases. * Most warm-season annuals might love the sun, but ol’ Sol can be a bit too much for them when they are first set out in the garden. To help with the transition, either transplant when the forecast calls for a couple days of cloudy weather, or make inverted v-shaped pieces of cardboard to set over the tender new plants to provide a few days of comforting shade while they get adjusted to the great gardening outdoors. L.A. Jackson is the former editor of Carolina Gardener Magazine. For more planting tips, or if you would like to ask him a question about your garden, go to his webpage at: southeastgardening.com.